The artist Rudi Kohl, geb. 1964 in Trier, is occupied as an autodidact since its earliest childhood with the painting. Already in its youth it tried to let its love flow to nature and animal world into its work. On its Pirschgängen by nature it tries everything that it busily, to take up with awake eyes. Its works are realistic, with a tendency to perfection. 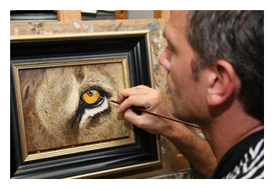 Until in the smallest detail draws, arranges he paints animals and landscapes in their natural beauty. , He tries to show each, also smallest detail in his works. Particularly the autumn and winter landscape fascinate it. Of the frost broken grasses, damp in its whole color variety, he paints with enthusiasm. In many of its work the animal does not stand, but nature in the foreground, as it the viewer also in true nature finds. With its work it would like not to up or explain, but mediate to the viewer beauty and splendour of the wilderness and its creatures. The exchange with renowned artists, exhibitions in the Netherlands and England as well as study trips to Canada, England, France and Spain coined/shaped it effectively. He works mainly in oil on canvas or wood. 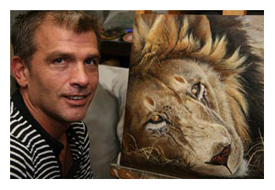 In addition, he controls techniques such as water color or pencil perfectly. The artist lives and works in 59457 Werl Westönnen in Westphalia.